Welcome to Day 2 of the Impression Obsession Valentine Release Blog Hop! We will be showcasing some great new stamps for you!!!! 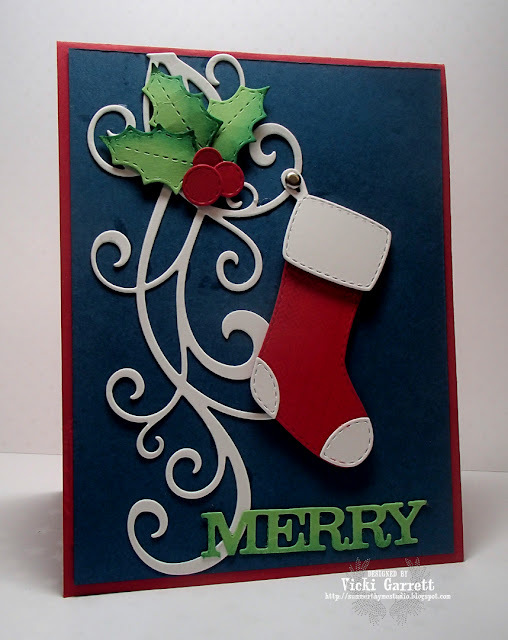 The Blog Hop will be posted on the Impression Obsession Blog at 6am EST December 29th and 30th. Visit our fabulous IO Design Team’s blogs (only one comment per blog please) for a chance to win TWO $25 Gift Certificates! 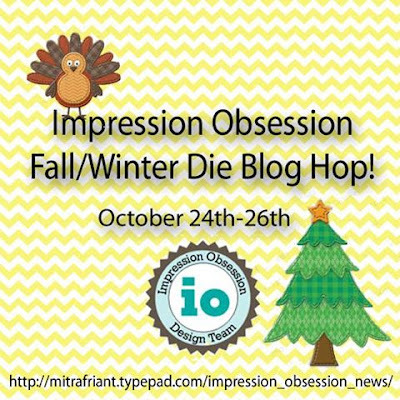 No need to comment on the Impression Obsession Blog to enter. January 1st and all winners will be announced January 2nd. 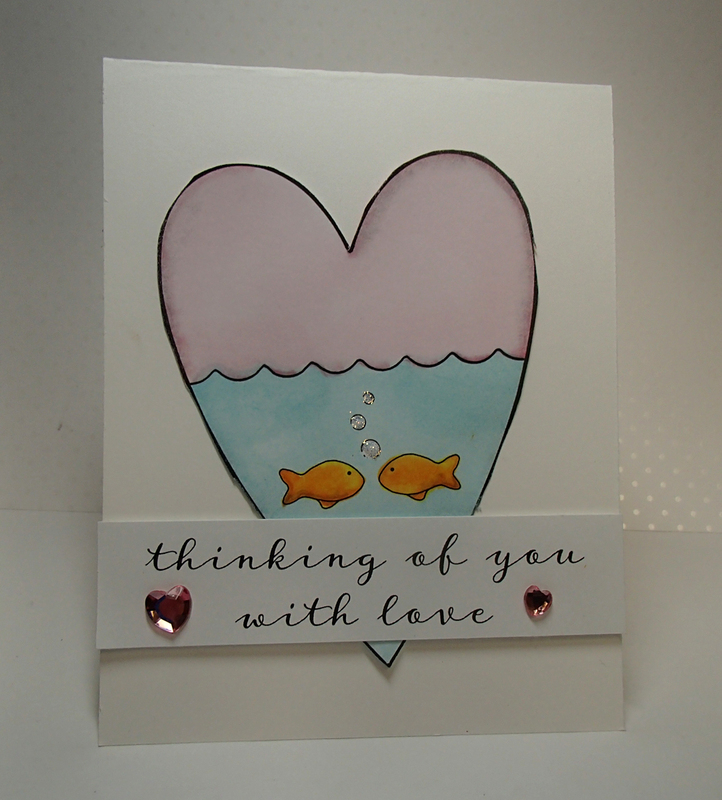 Just a simply sweet card! 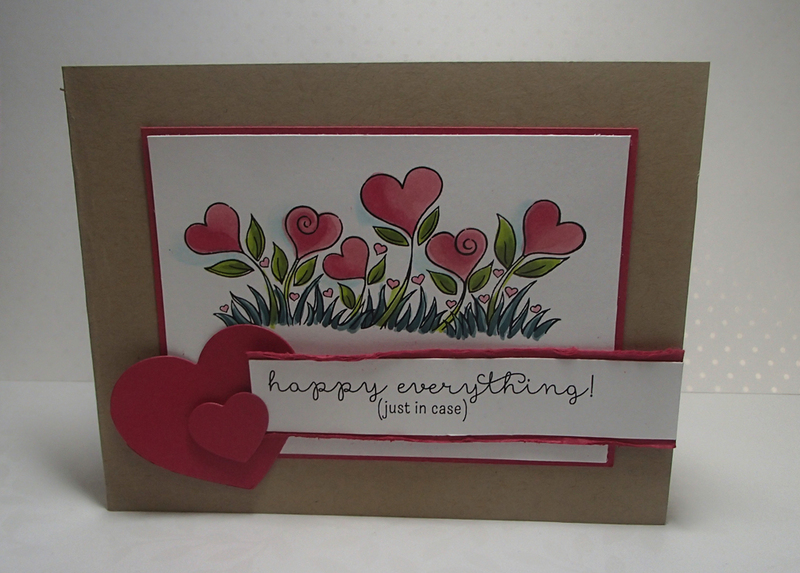 Welcome to the Impression Obsession Valentine Stamp Release Blog Hop! We have some beautiful new dies to share AND a Gift Certificate to give away! Comment entries will be open until 9pm CT on Sunday January 1st and all winners will be announced January 2nd. Are you all ready for Christmas? I'm getting there, but not quite! The Tree is up and the house is clean. Now it's a matter of wrapping gifts. 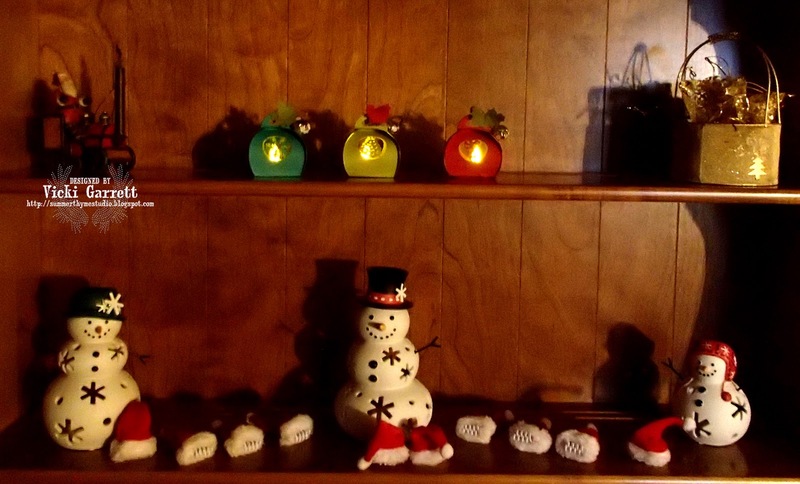 Speaking of gifts, our challenge this week is to create last minute Christmas Gifts! 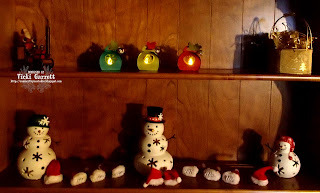 I used the little Tea lights from the dollar store. I used the Christmas Circle Cutouts to create designs in each box. 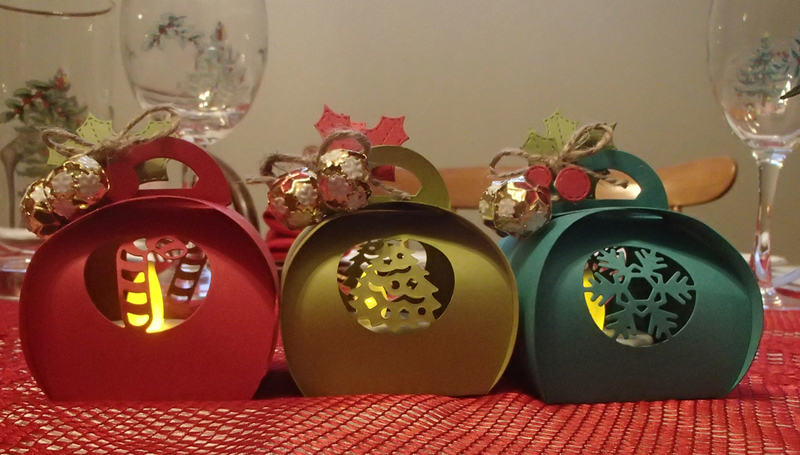 Lastly, I cut out the Patchwork Holly Die along with some Twine and Jingle Bells to finish off each box. 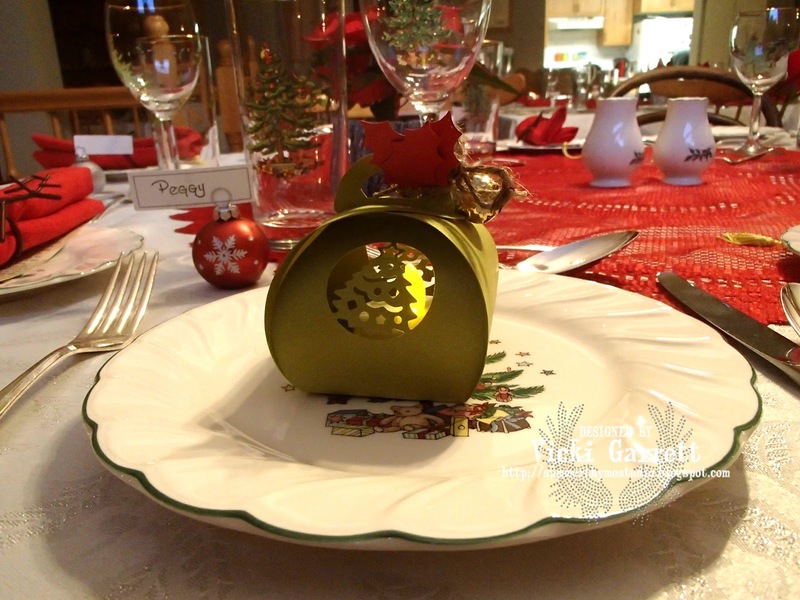 you can use these little boxes as a centrepiece or at each place setting to spruce things up a bit!!! Make sure you enter your creation on the Impression Obsession Blog for a chance to win a gift certificate for IO goodies!!!! Ohhhhh and some SUPER DUPER EXCITING NEWS!!!!! We have two new AMAZINGLY Talented Ladies on our Design Team. If you're not already familiar with their designs, they will not disappoint. So excited to have you both on board!!!! Here's on more view of these cheery boxes!!!!! Hope you have a Dandy Day!!! I'm excited to share my final project as a Guest Designer for Your Next Stamp! What a wonderful opportunity it was to create and share projects for them this month! 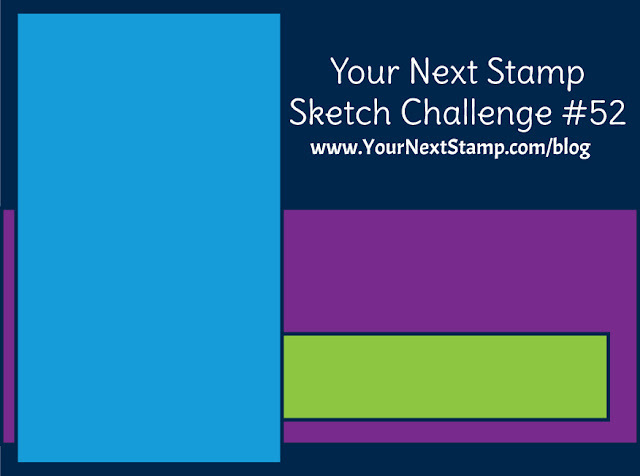 This week, they are having a Sketch Challenge. You can also combine it with a colour challenge as well if you like, but must use three of the five colours shown. 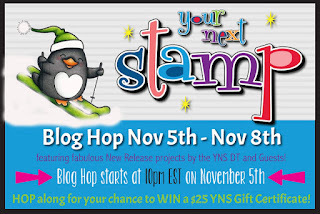 Please see the YNS stamp blog post for details. 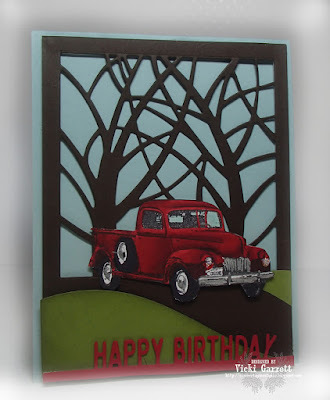 I had an idea to use the Paint Swooshes and Spatters set to form a background behind the tree. 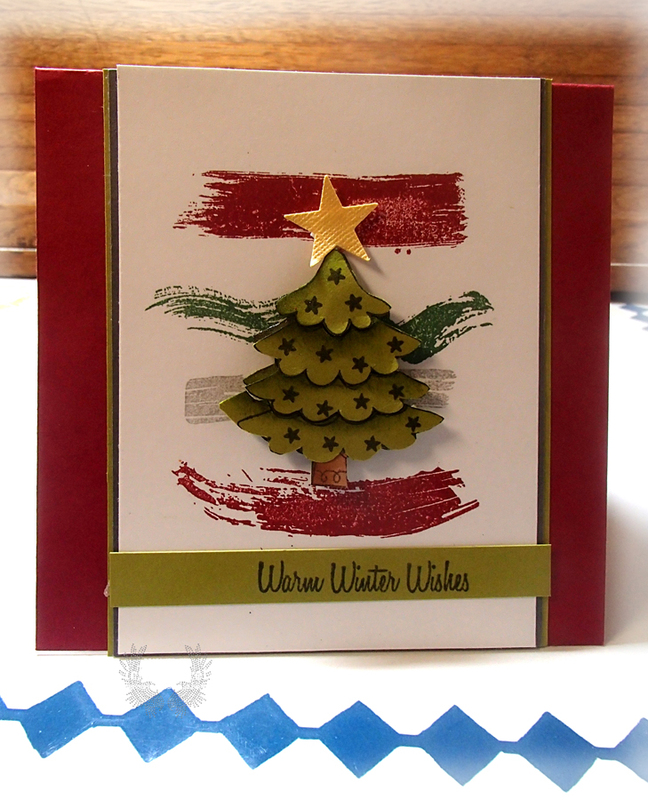 I wasn't sure how that would go, but I really like the way it turned out and think I may do some simple tree cards using this method. Now is a great time to as there is a sale going on until November 29th! I made my tag backgrounds with acrylic paint and acrylic paint washes and gel pen. I coloured the wee characters with Copic Markers and added a border of Washi Tape ( I found that one at the Dollar store) and loads of glitter!!!! 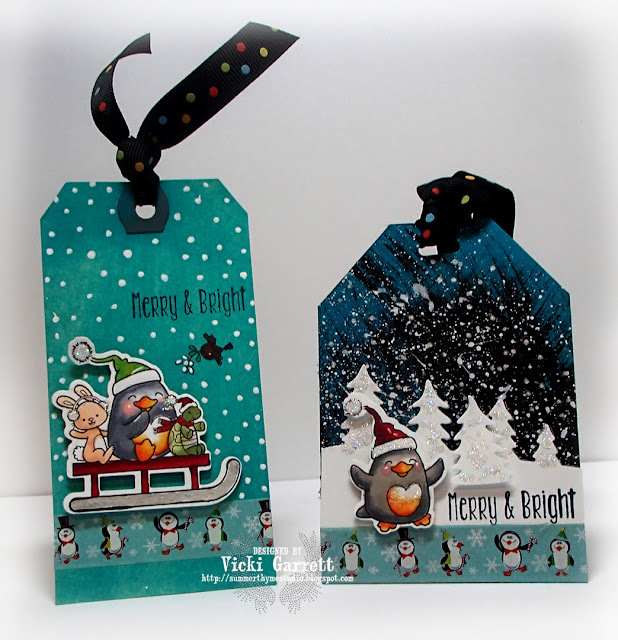 and leave a comment to get a chance at winning a new stamp set! Coloured the cute little image with Copic markers. I stamped the panel of Creamy Caramel with Early Espresso Ink. Challenge #52 is open through Thursday, November 24, 2016 at midnight EST. One random participant will win a $15.00 gift certificate to the YNS Store, plus if the winner uses YNS products on their creation they will receive an additional $5.00 on their gift certificate. We also select our favorite creation featuring YNS products from all participants and announce a “Top Pick”. The random winner and “Top Pick” will be announced on the YNS blog the Sunday following the challenge close. 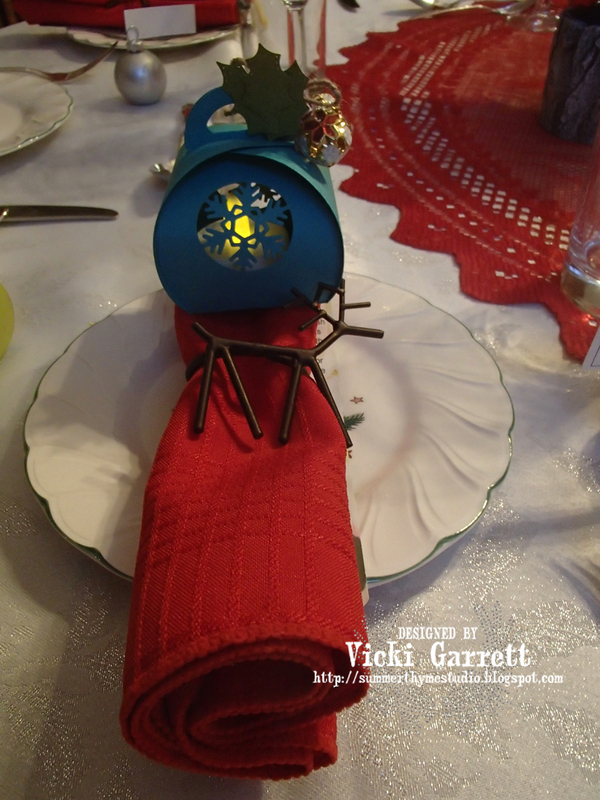 Link up a picture of your creation from your blog, gallery, etc. at the bottom of this post on the YNS Blog and you will be entered to win. Happy Wednesday! Are you glad to be halfway through the week? I am! The DT dare challenge was to create a project with the Theme Winter Fun. Nothing makes winter more fun than a waddle of cheery Penguins. Did you know that a group of Penguins are called a Waddle? How about when they're in the water? Well, then they're called a raft. That' s your touch of trivia for today. Now onto the card!!! I decided to colour the Waddle of Waddle's with my Prism Pencils as you can (well I can) achieve a softer look with them than with the Alcohol based markers. 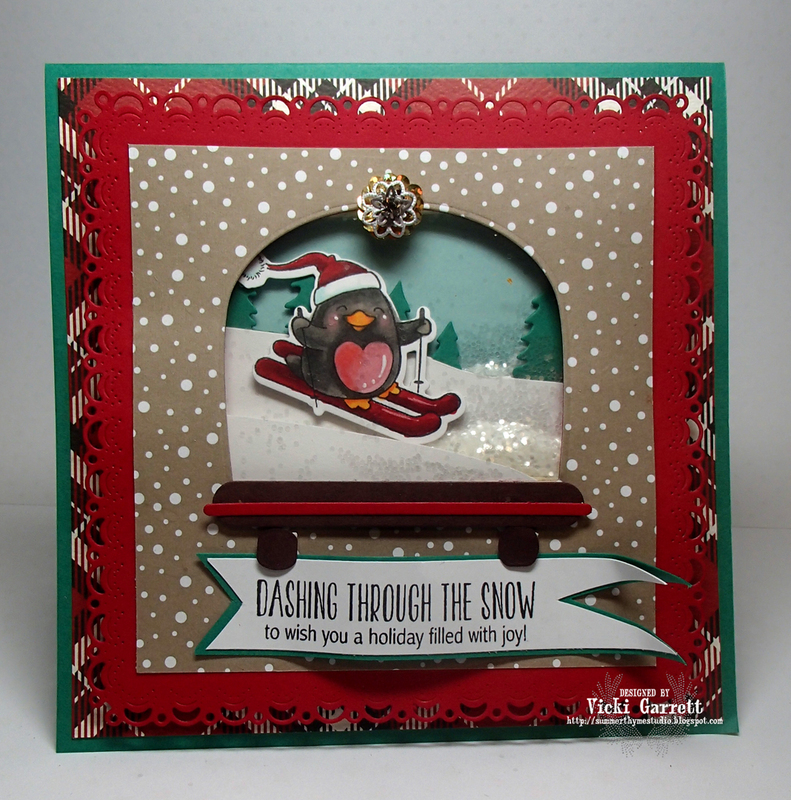 To create the snowy background, I used a Stampin' Up! 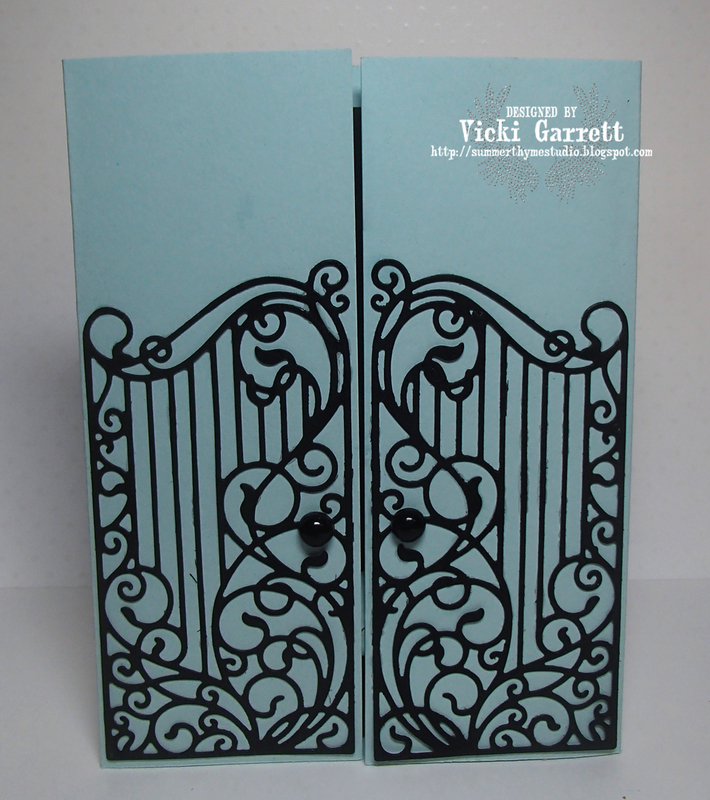 Embossing folder. I freehanded the snow drifts! 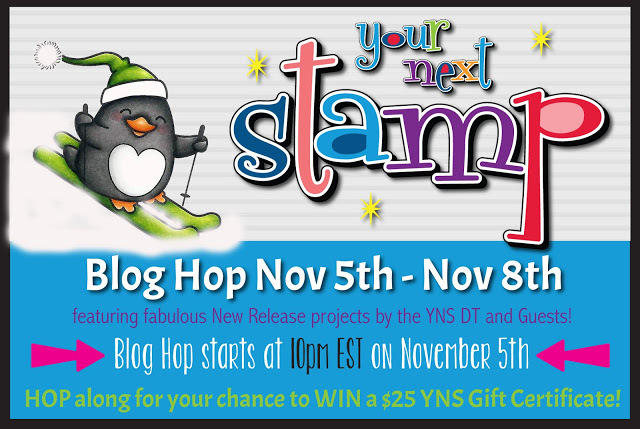 Be sure you visit the YNS Blog to leave a comment for a chance to win one stamp set of your choice. 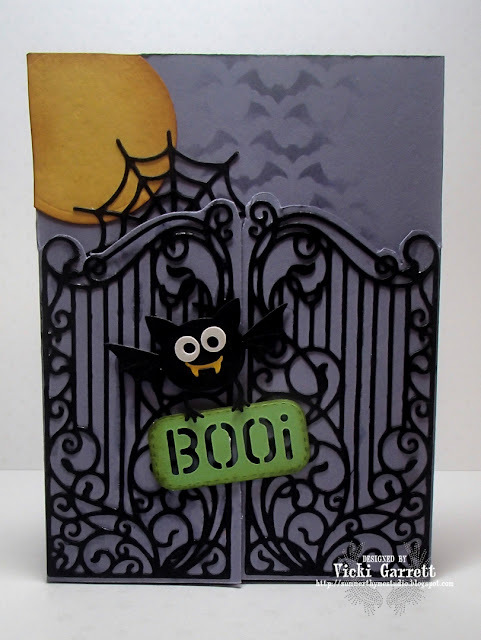 Your Next Stamp November Release Blog hop! 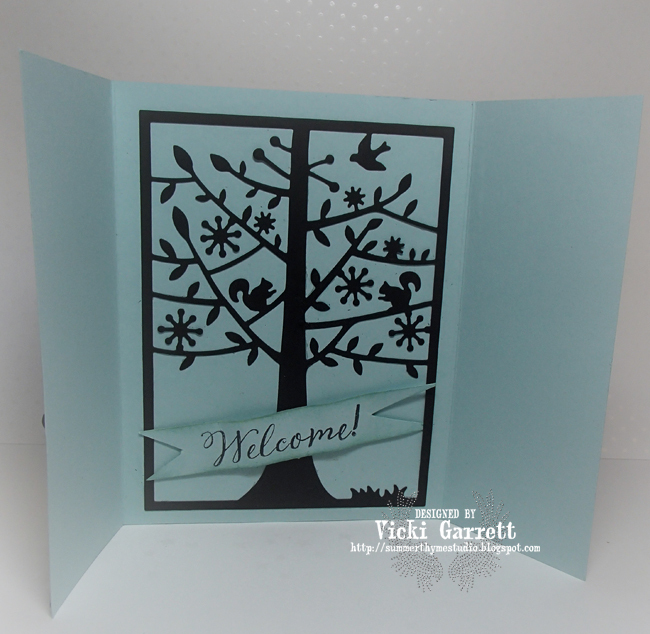 Welcome to the Your Next Stamp November release Blog Hop! I'm sure glad i'm one of the Guest Designers this month as the sets are fabulous!!!! I am going to have so much fun creating my Christmas Cards this year with the addition of these sweet sets. YNS will be giving away a $25 Gift Certificate, the more blogs you visit and comment on the greater the odds of winning, they do not have to comment on every blog to be qualified to win. 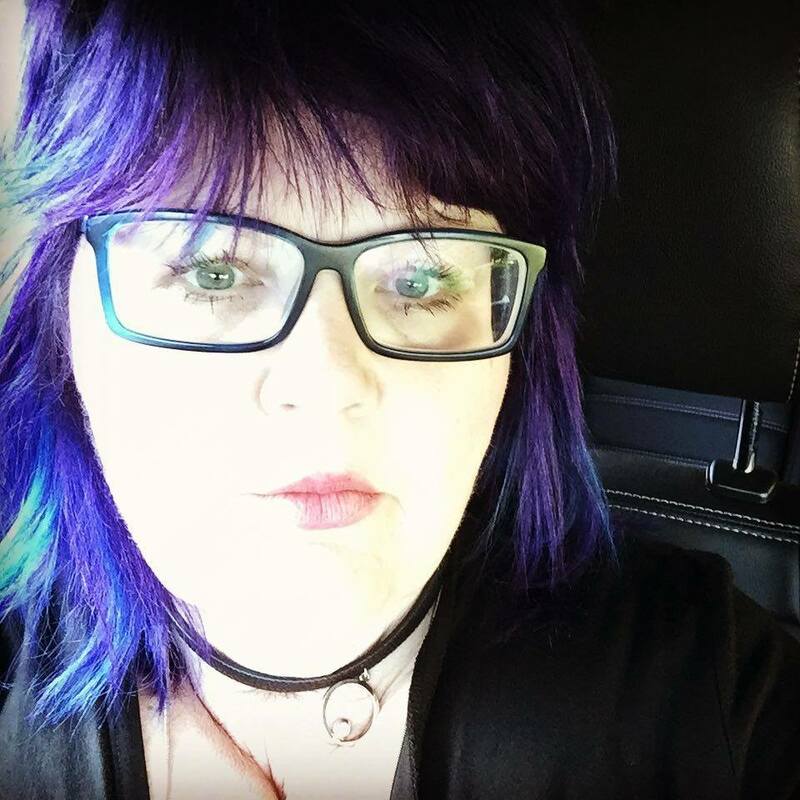 See the Linky at the bottom of the post to get to all the blogs! How about this little fella? Isn't he full of mischief? He is just one of many adorable characters in the Silly Monsters, Snow Cool Set!!! These guys are just what the Dr. ordered to warm your heart on a Cold Winters Day. 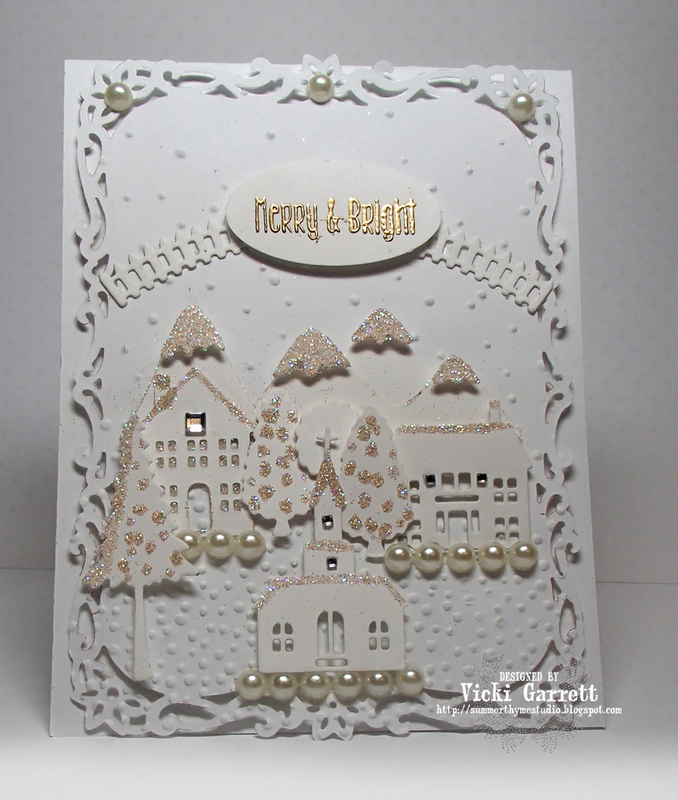 Once again, I used the Winter Fun Scene Set to jazz up the card a little!!!! I can see that I will get a ton of use out of this die set!!! I have reconfigured this post after having to delete the original as my cards seemed to only show for a minute before disappearing. Sorry for the inconvenience, but I wanted to be sure that you could see the projects! 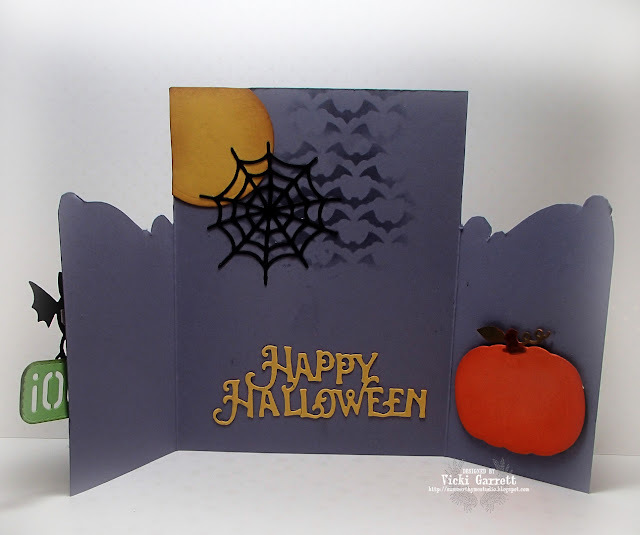 I'm looking forward to sharing some more YNS projects with you this month! Did you know that Your Next Stamp is having their November Release today? I'm so excited to share a preview using my Favourite Character Waddles! I created a shaker card using the new Wide Snowglobe die. I coloured waddles with my copic markers and used the coordinating die to cut him out. 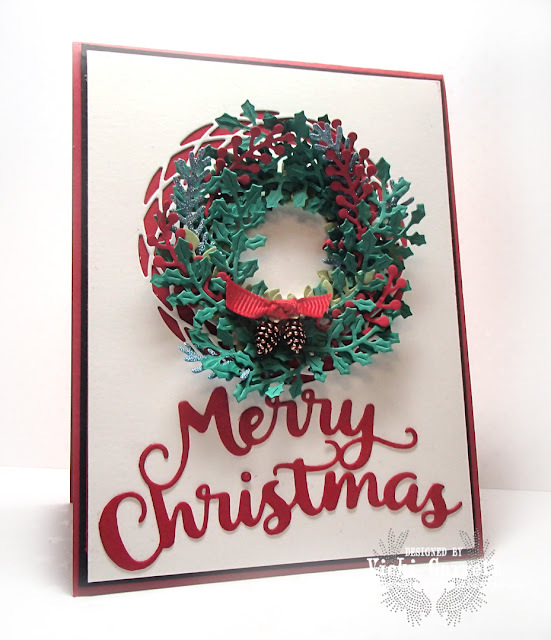 Designer Paper is by Carta Bella~ They have some gorgeous Holiday paper for sure! I'll see you a little later this evening for the blog hop! I had a blast paper piecing this fun Patchwork Turkey using Tim Holtz Halloween Papers. Lastly, I added the Give Thanks sentiment in dark brown cardstock! Lets see your finest Thanksgiving creation! I've got some Groovy news to share with you today! Their stamps are whimsical, sweet and way too cute! How cut is little Waddles as Santa? Waddles the Penguin has to be my ABSOLUTE FAVOURITE YNS stamp character!!! 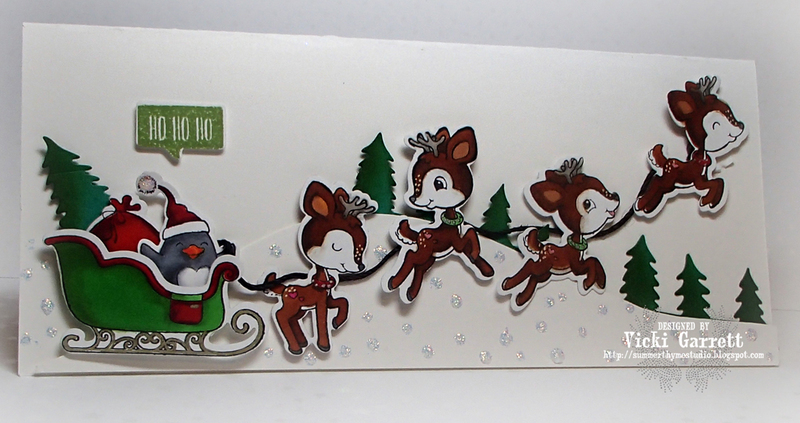 When Paired with this sweet sleigh and totally adorbs team of reindeer it makes for a darned cute Christmas card! I coloured up the images with my Copic Markers. 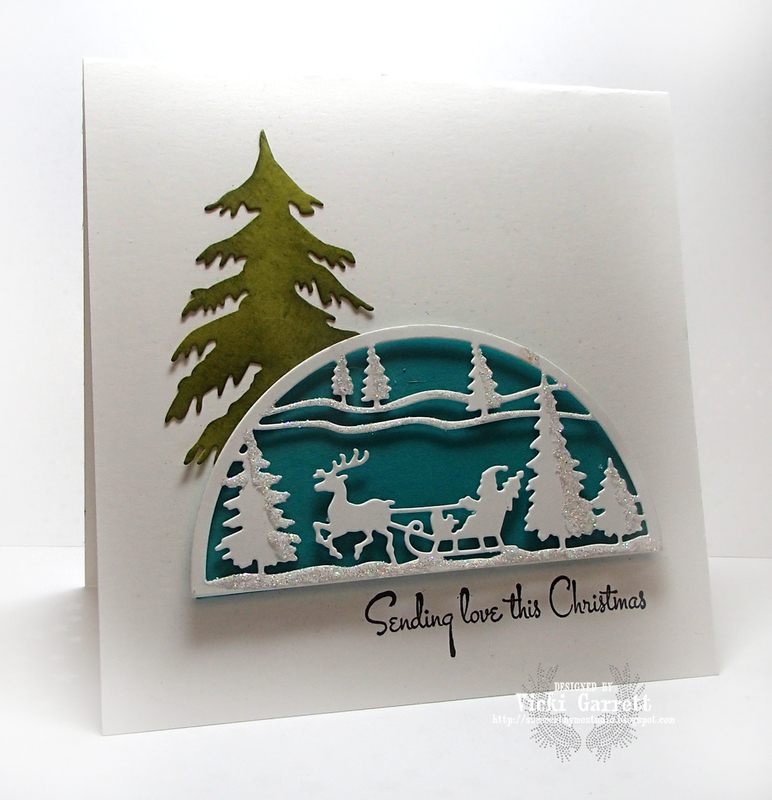 I freehanded the snow slope and added some evergreens using the Evergreen Tree Border Die. I cut it apart so I could add a big Christmas tree to fill the sleigh. I also cut the die apart to place the trees along the snow slope just so!!! The little sentiment was stamped in Gumball Green ink. I finished off the card by adding some freckles to the deer in Signo White Gel Pen, a little stickles and some hemp to secure Santa Waddles Team! 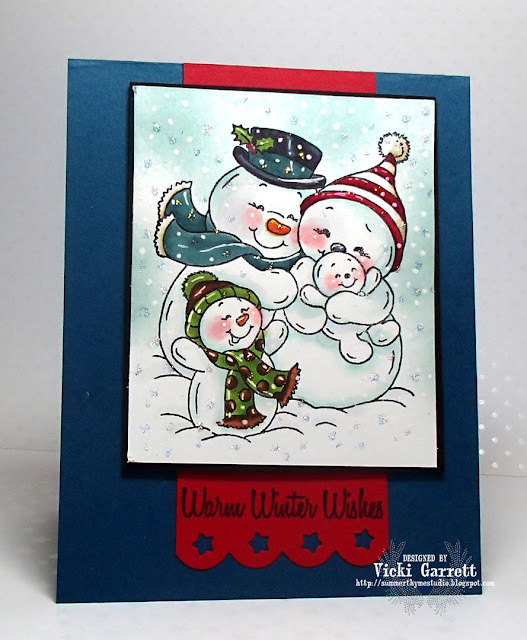 What do you think of this sweet Snowman Family Stamp? I think it's absolutely SCRUMPTIOUS!!! 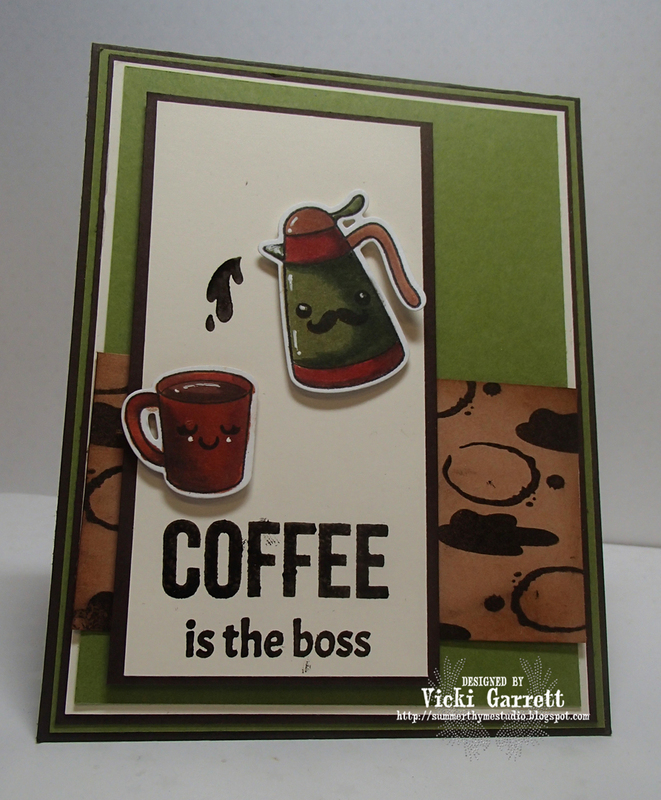 You will see this stamp a few times as I am going to make a few cards for my fave peeps with this one! Stay tuned for some more YNS creations all month long!! !